LOS ANGELES/HONG KONG - Walt Disney Co. has put the long-delayed expansion of its Hong Kong theme park on hold after failing to agree with the city's government on a cash infusion, the company said on Tuesday. Disney and the Hong Kong government have been embroiled in protracted discussions over financing a second phase of the world's smallest Disneyland and the first on Chinese soil. 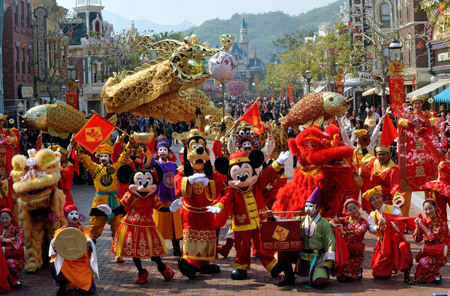 But Hong Kong Disneyland's visitor number projections failed to reach initial bullish predictions with the key Chinese tourist market now bogged down by a worldwide credit crunch and a decelerating economy that is discouraging travel. Disney said it would fire about 30 Hong Kong-based employees dubbed "Imagineers" that had helped conceptualize and plan the expansion. Some jobs might also go at Disney's home-turf of Burbank, California, as a result of the work stoppage, a source familiar with the situation told Reuters. The source, who spoke on condition of anonymity, said that Disney had already been funding creative efforts -- designing and envisioning the look of rides -- but decided to pull financing when it became clear that a deal with the government on expanding Disneyland was not imminent. "The uncertainty of the outcome requires us to immediately suspend all creative and design work on the project," the US firm said in a statement. The source however did not rule out a resumption of that effort should Disney eventually strike a deal with the city. Disney has also signed a framework agreement with the local government in Shanghai to kick off a project, and said in January it intended to submit a proper plan for the park. The Hong Kong government expressed "grave concern" about the decision and urged Disney to reconsider. "We consider that (Disney's) laying off of Walt Disney Imagineers who have been working on the design of Hong Kong Disneyland's expansion will not be conducive to the discussions and are puzzled by the company's decision," a spokesperson for the Commerce and Economic Development Bureau said in a statement. Opened in 2005, Hong Kong Disneyland has been criticized for being far too small to attract repeat visitors despite its proximity to Chinese mainland. "Despite this setback, The Walt Disney Company remains confident and committed to the long-term success of Hong Kong Disneyland," Disney said. An expansion could cost as much as HK$3 billion ($387 million), local media have reported. In December, the Sing Tao Daily newspaper reported that Disney -- in what was deemed an unusual concession -- may give the government a greater share in the project in repayment of a cash loan of nearly $800 million that the city had extended previously to the theme park. Hong Kong residents and lawmakers, for their part, have queried the financial viability of pumping more public money into the struggling park, on top of the hundreds of millions of dollars already loaned to the project. Disney has borrowed more than $1 billion for the project, including HK$6.1 billion it owed the city's government, due to be repaid over 25 years. In 2008, the theme park was forced to amend loan agreements after it failed to meet performance targets. That amended pact abolished targets but decreased the amount of a revolving credit facility.